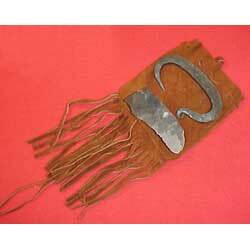 H&B FORGE STRIKER & FLINT KIT The flint striker was both a common trade item as well as an essential tool for everyday life on the early frontier. With flint and tinder, the strikers could be used to start a fire anytime for heat, light or cooking. Classic c-shaped flint strikers individually hand forged and properly hardened to throw showers of sparks for easy fire starting. To use, hold steel over fingers of the left hand and strike flint against steel with the right hand.